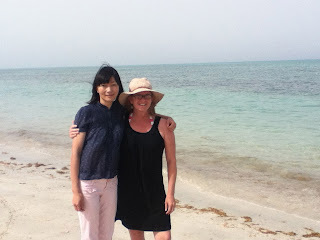 Our school/company has 4 different compounds in eastern Saudi Arabia, and we headed out to the beachside camp to visit some old friends that we worked with in China. Linda was our Chinese teacher in China, and she helped us translate all the information about Sojo when it arrived in Chinese. 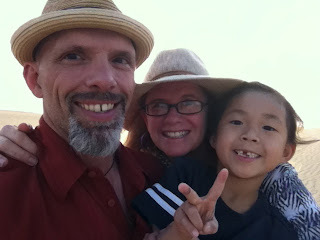 Six years have passed since we saw each other, and it was lovely spending the day on the beach and meeting their son for the first time. I love how paths cross over and over again overseas. And that Gulf water is so blue and green and gorgeous. I had no idea we would be at the beach more in Saudi than we were in Thailand! And our best camel experience yet! A family was crossing the highway (like, a main highway that tons of trucks use! aaaghhh!!) and so we had to slow down enough to let them cross. The babies were adorable! This is Sojo and her friend Umar. They are in the same class and both share a love of Star Wars. Most times when they play, they are actually training to be jedis, and there is lots of play fighting and wrestling going on. Until today, I thought that jedi training was the extent of their friendship. They walked around holding hands like this today for a loooong time on a trip we took. Like, way too long just to be Star Wars fans. Sojo is doing all sorts of fabulous and funny things of late. 1. They are working on sounding out words at school, so she has transferred this to her daily language. Often, she'll say things like, "Mama, can I have some Rah-Meh-Nuh Nuh-OO-duh-el-z?" and sounds out each word. That's ramen noodles, by the way, her current favorite food with zero nutritional value. 2. When she reads alone in bed and gets stuck on a word, she'll shout, "Mama!! P-L-A-Y?" My job is to yell back what the word is. It sounds like a cheer and is adorable. 3. After seeing our school play, she gets air quotes and is overusing them like crazy. It's hilarious as we joke around about what a "great listener" she is or what a "fun trip" that was. 4. More teeth are falling out and the front one is hanging by a thread. Thankfully, the tooth fairy remembered to take the tooth out of the box this time. Oops! During our three-day weekend, we headed off to Bahrain for the night. Bahrain is the place where all the expats go as it's easy to cross the border, and it is much more liberal than Saudi Arabia. Women do not have to wear abbayas, you can order a drink at a hotel, and I hear there is even pork available. Having been here 8 months now, I think we were the last people in the Kingdom to make it to there. It was definitely worth the wait as we loved the tiny country! Crossing over was gorgeous! The bluest of water contrasted against the sand-colored rocks was an amazing sight. We had to cross a long bridge first to get to the first immigration and then many, many more stops along the way before another long bridge into Bahrain. It is common in Bahrain for hotels to be attached to malls, and so we stayed in a spacious place that allowed us to go eat in the mall and do some shopping. These artsy, cool camels were placed all over the parking lot. Sojo was in love with these tigers (she seemed to think they were dogs, but that does not look like a dog to me) that you paid to ride around for 15 minutes. 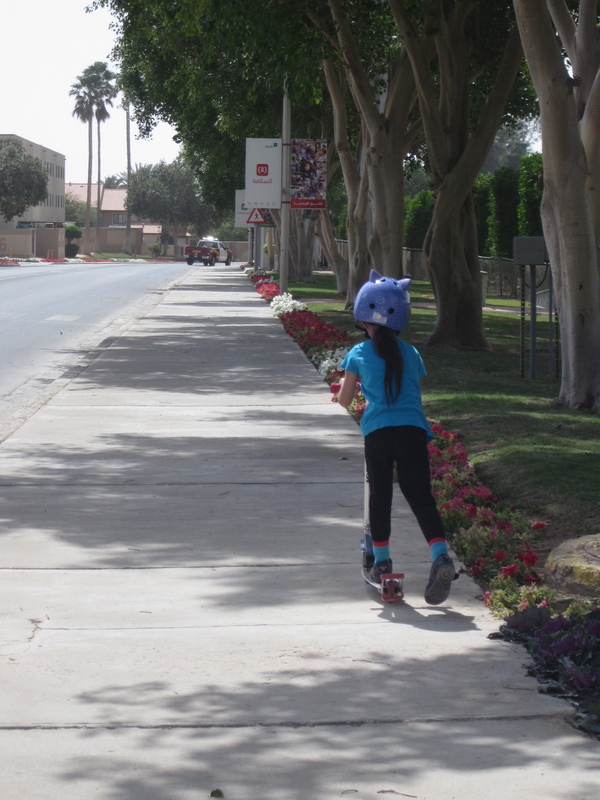 She powered it by gassing a pedal, and it was beyond comical to see her cruising around. Super fun. Our big plan in Bahrain was to go to Wahoo water park, an indoor water extravaganza that we have been hearing about from all the kids in Saudi. Sojo normally only wears a very long swimsuit that covers most of her body, but we somehow convinced her to wear this one. She was slightly freaking out at how small it is, and she suddenly turned all girlie when she put it on. Ballet dancing, posing, and other stunts that had us all cracking up. About that water park...before moving to Saudi, I switched to one-piece bathing suits as this is required of women even on our compound. I even bought one with a skirt on it to be more modest. However, it took me only a few minutes to notice at the water park that no women were in the water, only men. The only woman I saw was this woman in pink. Head-to-toe hot pink, and that was her swimsuit. Of course, Muslim women are going to be very modest when swimming, but somehow what I thought was me being modest suddenly looked very...well...immodest. I had to just deal with it and go on the water slides with Sojo, but it was uncomfortable. Much like what I imagine I would feel like in the US if I wore the hot pink outfit to the pool. On the way back from Bahrain today, we met up with some friends at this gorgeous beach near their house. The weather was great, the kids had a great time, and there was a whole school of dolphins showing off for us in the water. And, just because no trip is complete without a camel photo, here is the latest. I have asked Dale to now always stop on the side of the road if we see some close to the highway. They take our breath away every single time. Add a Hipstamatic touch and a desert sunset, and it's the perfect end to a great weekend. And we still have one more day off! Perfection! It seems to be becoming tradition within our teaching staff to head out to the dunes for a bonfire and general sand dune climbing when someone has family in town visiting. I love that as a good excuse for a mid-week dune adventure. One girl's 82 year old parents even climbed the dune! It was a fun few hours of climbing, taking photos and a table full of food. And this last photo is of Sojo with her ever-growing "computer" she has made at daycare after school. A closer look shows that it is so intricate with gears and levers and all sorts of fun stuff. She shows me every day what she adds to it. This grainy photo was taken from our bed into Sojo's bedroom. I love how we are down the hall from each other in our new house instead of next door like in Thailand. It gives us a peek into her and also makes her feel more secure knowing she can see us. The other night, she had trouble going to sleep and asked if she could read a few books in bed. She was super quiet in there and then called out, "What does "was" backwards say?" Love it! She then informed us that we could go back to our movie while she read. This is atypical as she loves to be around us every second before she goes to sleep. Of course, we were distracted by the cuteness down the hall bathed in that reading light. This post has to be top secret as Sojo slightly freaked out when I took this picture the other day. And slightly is an understatement. * She actually made me promise to delete it, but I couldn't do it. You see, she has been reading these great books every night for homework in Kindergarten. Perfect books for her age and with just the right amount of words, but she's not totally into them. And then we checked out a Star Wars Jedi Guide from the library. 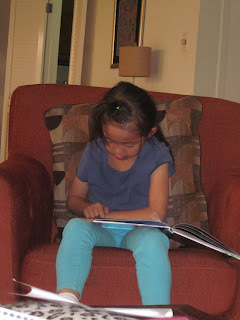 For three days, it's all we read--early in the morning, right after school and before bed. I can now recite every level of Jedi skills and list the chain of events that caused the downfall of Darth Vader/Anakin Skywalker. And then it clicked. We came home from school the other day, and she sat alone with her book while I was on the couch. I looked up, and this is what I saw. Tiny, heart-shaped lips moving quietly and sounding out the words. All by herself. And then hearing things like, "Your...lightsaber...is your...life." So I'm sorry, sweet Sojo. I had to keep the picture since this was a super cool day in your life. Maybe you'll understand when you are older. 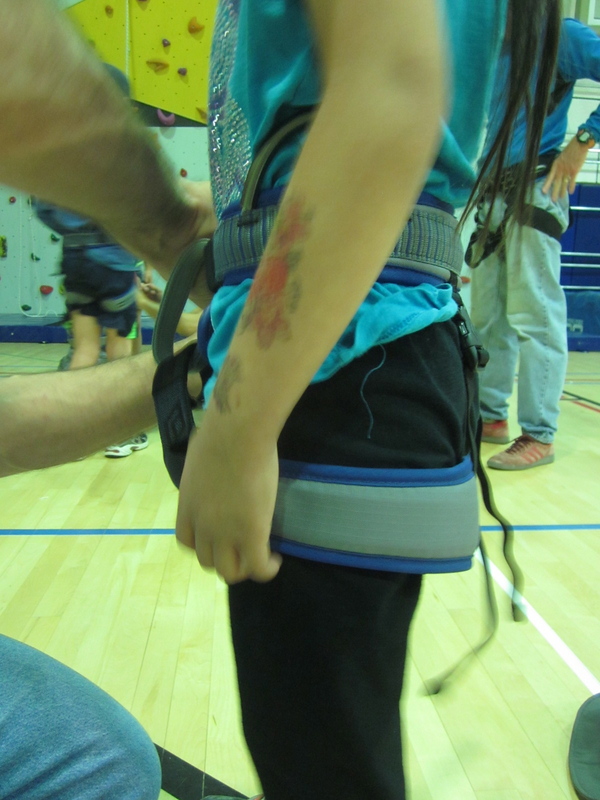 * Age 6 is proving to be challenging in that Sojo has very strong reactions--teenager-like reactions!-- more than ever before. We were lucky to skip the terrible 2's, but 6 is giving me a run for my money. Even Sojo said the other day, "you've got to love 'em through it." True that, Sojo. Making the trip to Khobar to restaurants and malls and IKEA is about two hours from here, so it's a whole day affair when we do it. We've been trying to carve out a day for a while now, and finally we had a free day to make the journey. Only problem was it was the same day as a pretty big shamal/sandstorm. We decided not to let that stop us, and we headed out into a sand adventure. Both of us love the look of sand wisping across the road, but the taste of it in your mouth is not so great. Our big mission was to head to Toys R Us because Sojo has been saving her money for months now to buy a really big Chewbacca toy. Since it was pretty expensive, she was to save half and we would give her the other half. Thanks to some chores and a Chinese New Year hong bao, she finally made it (it was tougher than I thought to get that girl to work for money--she's been spoiled by nannies and maids for too long!) I truly can't believe that they had a Chewbacca doll there, and there was only one. We had prepared her for being disappointed, but instead it was pure glee! This photo is at Applebee's restaurant. I get a kick out of the 'drink menu' in a dry country. The salads aren't quite the same as the US, but it's pretty good. Driving back home was more fun because of our new friend, and we wound up stopping to see a rogue camel on the highway being chased by his herder. They are in the median here---we do have paved roads! I had to have a photo with camels and the colorful head scarf today. Plus, Sojo had to pee and was almost blown away getting out of the car! And the piece de resistance--new P.E. shoes. Golden, of course. 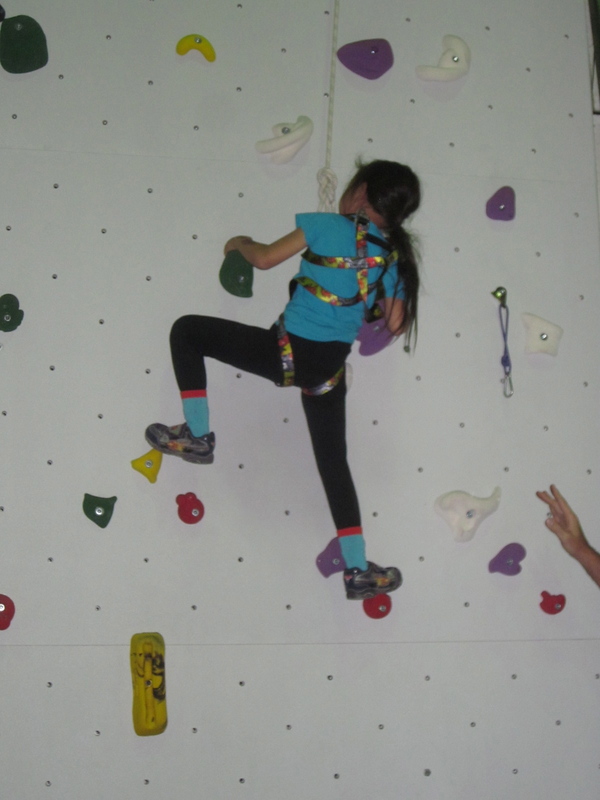 We have this pretty amazing climbing wall in our school gym. It's new this year and looks like a ton of fun. So, when our friend let us know he was having some kids join him this weekend for a bit of climbing, we hustled on over. 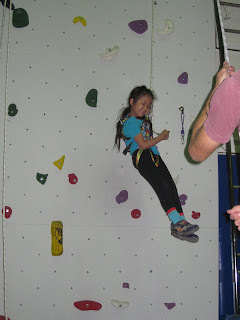 In Sojo's words--"It's fun to watch but then when you go up, it's scary so you want to come down. But then you want to go up and try again." She did go up and down a few times, and she held her own quite well for the first time. I love seeing Dale's baba hands in the corner of the picture...always at the ready to protect his girl. Eek!! That hair is a bit out of control (mine, too!). After her bath last night, this mama took some scissors and chopped off about 4 inches of hair. I am fairly sure she has not had a trim since Bangkok, which was many, many months ago. Oops. and all the colors in our green town in the desert, which is referred to as the "flower city."